In the arena at the 1997 ABGA National in class after class you couldn't miss the Powell-Holman goats. They were in near-perfect condition, immaculately groomed, broken to lead, handle and show, and they swept the ribbons. I couldn't help wondering how these girls got their start. Could it possibly be as easy as Claire Powell and Sharon Holman made it look? Curiosity got the best of me and I had to ask Claire. She enjoyed a good laugh as she replied, "Easy? Hardly! We began like everyone else. The goats were purchased. Kids were born. It was time for pay day, but there was a problem: how to let folks know we have some very nice animals!" Due to the remoteness of their location, the only solution the sisters could come up with was to take the goats to the public and let them see the animals themselves. But this presented another problem. Neither Claire nor Sharon had any experience preparing goats for show. In the same tradition that most problems are handled, the girls assumed a can-do attitude. Although they had no clue about what to do, they simply decided there was no better way to learn than to let experience be their teacher. They hitched up their trailer, packed up the goats and with the enthusiasm born of inexperience, arrived at their first show with their goats and a bottle of shampoo. As they began to look at the other animals, they realized a pair of clippers and scissors were a must. They learned lesson number one: the day before the show was not the best time to be learning to clip your goats. Now, with two years' experience under their belts, their approach has changed considerably. All the animals are clipped two weeks prior to the show. The goats are trained to lead and stand relaxed. An animal that is scared and not comfortable being handled will not present itself well to a judge. Some goats will break to lead quickly and seem to enjoy showing themselves. Others are not at all cooperative and never give in to allowing themselves to being easily handled. At this point another goat of comparable quality should be selected to take their place in the show string. Claire confided that for her, "The hardest part of showing is not telling yourself that all your goats look terrible and there is no need to even go to the show." The girls know they do not own a goat that is perfect. "When you spend hours each day with your animals, feeding, grooming and caring for them, you have plenty of opportunity to study them and find each imperfection." Above, from left to right, Marty, Claire and Johnny Powell. Mark, Jimmy, Sharon and Marilyn Holman. "An equally difficult part of showing," Claire said, "is presenting an animal you are quite proud of to a judge and inviting him to find fault. The reaction to this scrutiny can be quite frustrating and the temptation to give up quite strong." For the first two years in the show circuit, the sisters were not awarded one blue ribbon. The 1997 show was the start of Powell-Holman reaching a new level of quality in their animals and, much to their pleasure, it was recognized by the judges. As I suspected, in this business there is seldom an overnight success. Rarely does anyone start with the best animals. The key to success, however, is that you don't have to remain at your level of entry and, once you achieve success, you must not relax and assume winning will be easy from there on out. The competition will not allow you to bask in the glory of winning for very long. Above, at the 1997 San Angelo Stock Show and Rodeo, another top win as Grand Champion Buck and Grand Champion Doe. What about the future? "It will be most interesting to see if the offspring of our champions can follow in the footsteps of their parents and achieve the same level of success," Claire said. "Breeding season will arrive shortly. With the recent purchase of some new blood lines, the challenge of mixing new blood with old to reach an even higher level of quality at Powell-Holman will be attempted." 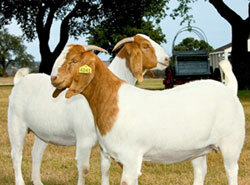 Only time will tell what the future holds for Powell-Holman Boer goats. The sisters love what they are doing and it shows.